It’s plain to see that the utility industry is facing a deep digital transformation. Renewables, distributed generation, smart grids, new regulations, changing customer expectations, and a host of other factors are driving a revolution to reshape how distribution utilities do business. While the challenges may differ somewhat, depending on geographical location, region, and economy, the core issue remains the same — how can utilities manage these changes to their business, adapt, and thrive in the new energy world? Seismic shifts like this can feel like a threat as they upend and disrupt the traditional business model. However, it would be unwise to try to avoid the move to more digitized utilities, so if words like “transformation” fill you with a sense of dread, substitute the word “opportunity.” That’s what utilities are truly encountering — a massive opportunity to improve processes, increase efficiency, cut downtime, and engage with customers, just to name a few. What do we mean by digitization? It’s a powerful series of technological and business model solutions to many of utilities’ challenges and focuses on creating a data-centric organization. Take, for example, smart grids. They depend on smart, automated controls and sensors to send and receive data. This data is then analyzed using predictive analytics. The result is improved network resiliency, safety, efficiency, and better grid visibility. “But does the energy business really need to digitize?” you may ask yourself. The answer is an emphatic “yes” because of the wide range of opportunities digitization opens. It can improve all realms of the business including integrating distributed energy resources (DERs), addressing fluctuating energy demands, cutting losses, and providing stability, reliability and support to utilities’ business. Senior-level executives at power and utility companies are already on board with the idea, according to a PwC survey. It found that a majority of the execs they interviewed (70%) reported that their companies aspire to be a digital leader, although nearly 60% are still insufficiently investing to meet that goal. Adopting digitization efforts to solve utilities’ transformation objectives is about more than just a financial investment, though. It’s a team effort that requires an organized, cohesive approach with a focus on the convergence of operational technology (OT) and information technology (IT), an accelerated adoption of the Internet of Things (IoT), better data interaction within and among systems, and support for the increasing need for data exchange. These seven steps are a good start in planning and implementing digital transformation. 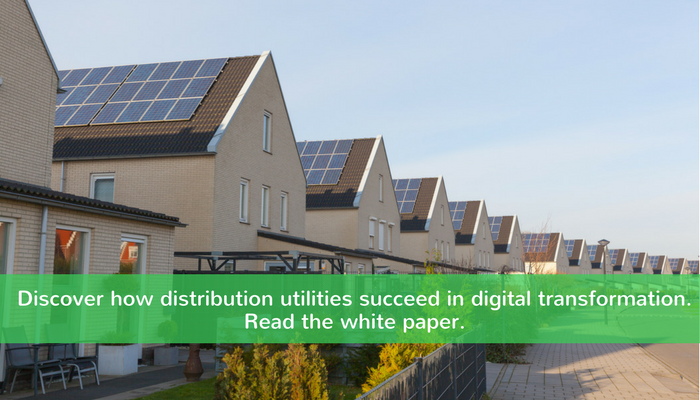 Read our white paper “How distribution utilities succeed in digital transformation” for a closer look at the drivers and a more detailed strategy for successfully transitioning to a more digitized utility.